I often refer to El Paso as Vast Mini Nowhere so sometimes people assume I never get out of the house or do anything interesting, mini or otherwise. Quite the contrary, I often make short trips to all kinds of interesting places, particularly for festivals, bazaars and regional celebrations. Mother Goose also has been very good at letting me know when something is coming up in FairyLand that I might enjoy. I had such an invitation in February, when the Queen of Hearts was to hold her Public Day in FairyLand. A most gracious woman, the Queen personally speaks with any member of her kingdom who takes the time to sign up. I, of course, not being an official resident, didn't expect to have a personal audience, but with Mother Goose's invitation, I would be able to observe this occasion. 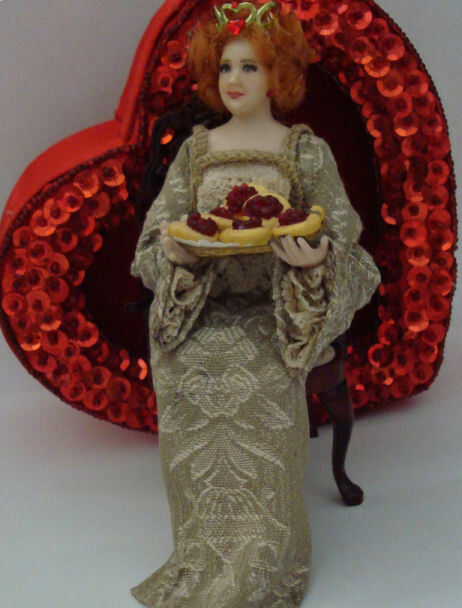 On Public Day, after each subject has spoken of his or her concerns and she has offered her queenly observation, the Queen of Hearts personally hands out tarts, which not only puts her audience more at ease, but allows her to share the largess of her extensive kitchens and the culinary accomplishments of her chefs. The very idea that I could observe this happening, and perhaps even have one of those tarts, which are from an old family recipe, filled me with excitement. I mean, the opportunity to meet royalty is not something that really happens here in El Paso. As it happened, it was late in the day when we reached the ceremony location, which was not in the castle but on a simple outdoor stage. As we approached, I was amazed to see behind the Queen's royal seat a long line of attendants with trays containing seemingly an unending supply of tarts. Observing the tray she was holding, I whispered, "I'll bet her arms get tired before the day is out." "Queens don't become queens overnight, you know," Mother Goose whispered back. "There are many lessons for years on deportment, etiquette and propriety. You wouldn't believe how long she can sit there, ramrod straight in that chair, holding that tray. A queen is taught to look composed at all times. No matter how tired, how sick, how upset she might really be, her subjects are never to know it." "I can see having an audience with one's subjects, but why the handing out of the tarts?" I asked. "Wanna, do you remember the old nursery rhyme about the Queen of Hearts?" Mother Goose inquired. "Oh, yes, I learned it when I was a child. Why, I think I can still recite it," I said. I can't recall the rest of it." "Well, as with so many nursery rhymes, that one is based on a true story, but of course there's more to it than that. Long ago, a special Princess, an early ancestor of the present Queen of Hearts, was not at all interested in becoming a future queen. In those days young women, especially young royal women, did not go against their fathers or tradition, but the Princess often left her how-to-be-a-queen lessons to sneak down to spend time with the cooks in the royal kitchens. Although they loved their daughter dearly, the King and Queen of Hearts were a bit embarrassed at this decidedly unroyal behavior, but she was their only child and they figured she would grow out of it. 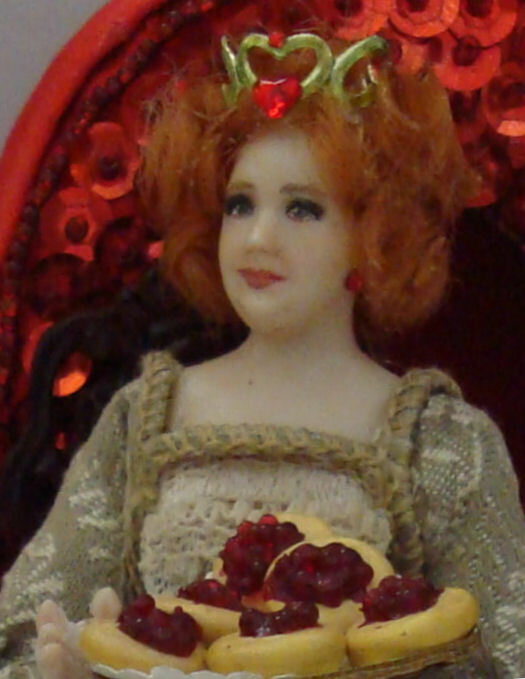 And besides that, the Princess's baking was so tasty that they often secretly had her currant buns for breakfast. Not long before her 18th birthday the Princess was betrothed by her father to a Prince from a neighboring kingdom, a distant cousin who turned out to be a really unpleasant young man. On his first visit, he offended practically everyone in the royal household because of his rude and oafish behavior, although none dared say anything. Although the Princess managed to slip away most of the time when he approached, one day the Prince followed her to the royal kitchens and something happened there that greatly displeased both the royal chef and the King, when he found out about it. There was a big scene and the last report was that the Unpleasant Prince didn't stop running until he had crossed the boundary to his own country. In celebration of her broken engagement, the Princess rolled up her royal sleeves, baked for several days and handed out tarts to the entire countryside in gratitude. And eventually she did marry a slightly plump but quite pleasant young Prince, a more amiable distant cousin, who loved fruit tarts. 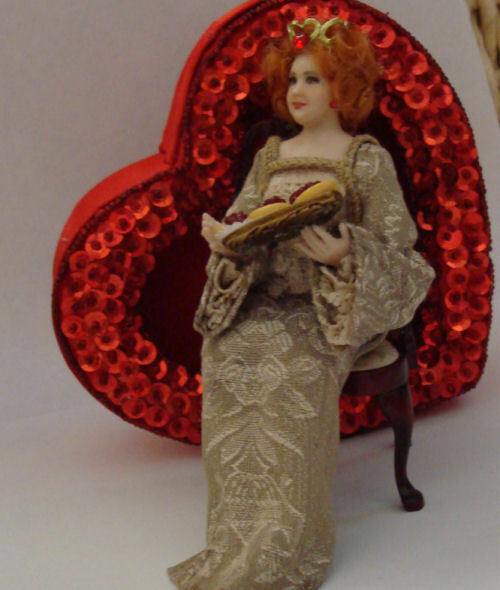 And every Queen of Hearts since then has continued the custom of handing out tarts on Public Day." "Wow, how interesting. I wonder what the Unpleasant Prince did ...." I began, but at this point Mother Goose nudged me and whispered, "We're almost there. Slip into the line here and you can have an audience, too. " An audience! What to say, what to do? Was an audience with this Queen like one with the Queen of England? Good grief, I thought, I don't even know how to curtsy. And do Americans curtsy, anyway? And before I knew it, I was next in line before her. Somehow I expected the Queen of Hearts to be, well, different. Older, for one thing. And to my great surprise she turned out to be quite attractive, in a Bette Midler sort of way. Actually, I needn't have worried about how to behave in the royal presence. Just as I approached the queen, my mouth open to say SOMETHING, I noticed her peering over my shoulder, a stunned look on her face. Well, considering the rigorous training that queens have in controlling themselves, the casual observer might ask, "Stunned? What do you mean, stunned? She looks pretty calm to me." 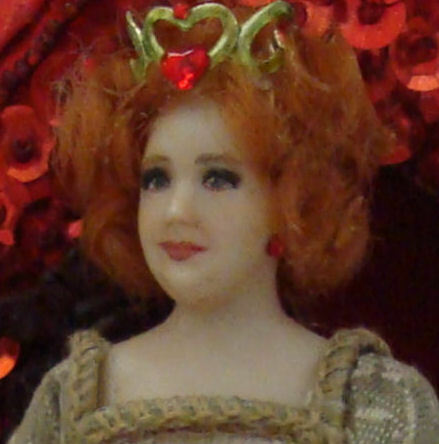 However, I like to think that I am astute enough to catch even the slightest flickers of emotion, and I am here to tell you that the Queen of Hearts was upset! The Queen had apparently spotted a descendant of that OTHER family, the one whose ancestor was the oafish Knave, and before I could have my audience, she dropped the tray of tarts and left the stage in a real hurry, leaving her attendants in a bit of a dither, holding their trays of tarts, uncertain as to whether to follow her or not. One of the Royal Somebodies recovered quickly and shouted, "The Queen's Public Day is concluded! The public may partake of the Queen's tarts now. " People crowded to the royal stage as the royal buglers began to play and the royal attendants, who had been holding their trays high in the air like jugglers, lined up to dispense the tarts to the population. "Let's don't bother with all this crush of people, dear," Mother Goose said. "I know an excellent little baker's shop just around the corner where we can sit down, relax and have a treat, just the two of us." I was both relieved and disappointed. So, that's the way it went. 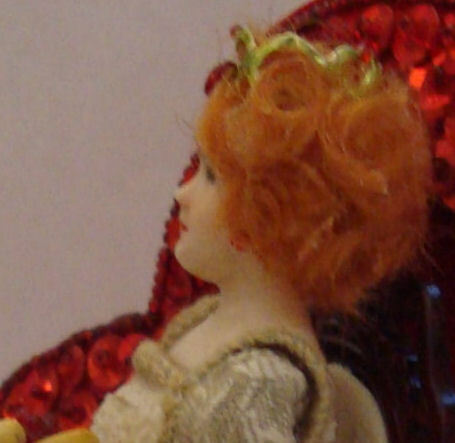 We wound up having tea and "Four currant buns in a baker's shop, Round and fat with sugar on the top ...."
"Perhaps you can have an audience with the Queen another time, my dear," Mother Goose said, patting me on the shoulder as I said goodbye. "I understand that next year the tarts will be blueberry." 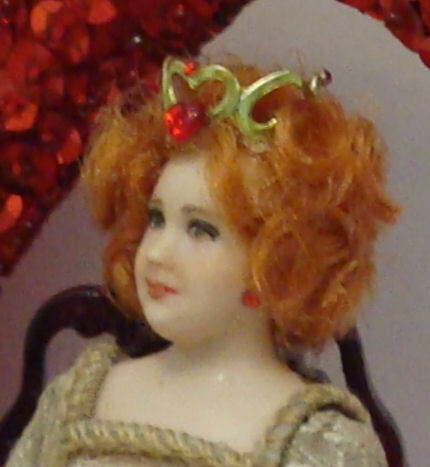 You can read about the making of the Queen of Hearts here. Copyright <>Juawanna Newman . All rights reserved.